Most recently, EOS Surfaces has turned its attention toward the growing concern and costs of hospital-acquired infections (HAIs), also known as nosocomial infections. The company joins the efforts to lower the alarming infection rates with the launch of its latest product, EOScu. With a goal of assisting hospitals in lowering the rate of these infections, EOS forged a relationship with Richmond, VA-based Cupron, Inc., a subsidiary of Virginia Life Sciences. Cupron is a copper-based technology that harnesses the superior antimicrobial powers of copper within a polymer structure. It was licensed for use in textiles and cosmetics and other applications, but wasn’t yet considered the surface materials market. After over a year of experimentation and testing, EOS Surfaces developed a powerful surface material that effectively leveraged Cupron’s proprietary copper-based technology harnessing the power of copper. EOS launched EOScu, the powerful innovation in Preventive|Biocidal surfaces that met the requirements for EPA registration. EOScu has the advantages of solid surface—durability, virtually seamless fabrication, and a beautiful aesthetic—with the unparalleled ability to self-sanitize. It continuously kills harmful bacteria* contributing to the spread of illnesses. EOScu kills greater than 99.9% of bacteria*, within 2 hours and continues to kill 99% of bacteria* even after repeated contamination. *Testing demonstrates effective antibacterial activity against Staphylococcus aureus (ATCC 6538), Enterobacter aerogenes (ATCC 13048), Methicillin-resistant Staphylococcus aureus (MRSA-ATCC 33592), Escherichia coli O157:H7 (ATCC 35150) and Pseudomonas aeruginosa (ATCC 15442). 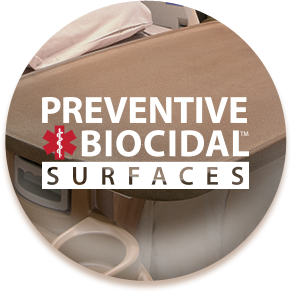 The use of EOScu is a supplement to, and not a substitute for, standard infection control practices; users must continue to follow all current infection control practices, including those practices related to cleaning and disinfection of environmental surfaces. EOScu has been shown to reduce microbial contamination but it does not necessarily prevent cross contamination. This product must not be waxed, painted, lacquered, varnished, or otherwise coated. This product must be installed by a certified EOScu fabricator only.